Previously on blog, I shared some ideas on how men can dress to attend wedding reception. It would be great for me to share some wedding dresses from www.modabridal.co.uk that ladies can wear this time! 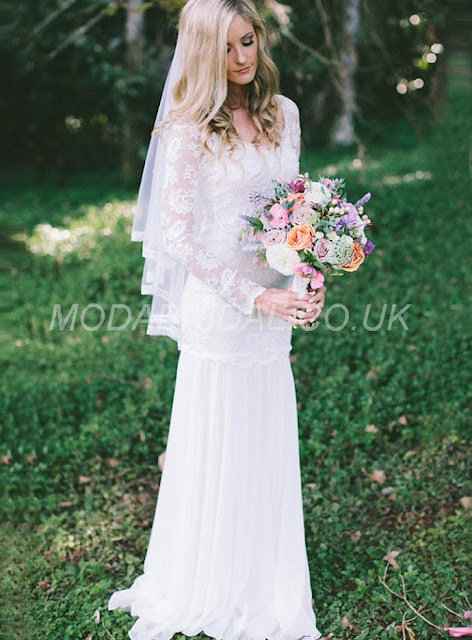 Modabridal.co.uk is an online store which sale different kinds of fashion wedding dresses, special occasions dresses, shoes, accessories, etc. If you are looking for anything I just mentioned, you should check the website out! I'm going to share some of my favourites from the website and be sure to check them out as well! The reason why you should order dresses from Modabridal.co.uk is because the website is so convenient for you to search for the dresses you are looking for, especially for wedding dresses! You can shop by style, category, fabric and colour! Still not convinced? The reason why people are so afraid of online shopping is because they are not sure if the size of the clothing suit them or not. Luckily, I can guarantee you do not need to be worried at Modabridal.co.uk! It provide detailed size chart and measurement guide for you! You just have to follow these and everything will be fine! Also, it provide worldwide shipping too! No matter where you are, the dresses you want can be delivered to you! I really love the beach wedding dresses from Modabridal.co.uk as the design of the dresses are so unique! There are total 143 beach wedding dresses that you guys can choose! It can definitely make you or your lady look so beautiful! Here are some of my favourite beach wedding dresses. You can check out more beach wedding dress by clicking http://www.modabridal.co.uk/beach-wedding-dresses-c122161/ ! Weddingforward.com is an online store which sells different kinds of fashion wedding dresses, special occasions dresses, shoes, accessories, etc.The reason why you should order dresses from Weddingforward.com is that the website is so convenient for you to search for the dresses you are looking for, especially for wedding dresses! I can guarantee you do not need to be worried. There are many elements that make up a perfect father father-daughter wedding dance song. It needs to be easy to dance to, sentimental and sweet. After all, this is one of the highlights of the wedding and every daughter wants the song that says it all. We’ve put together a special list based on songs most frequently requested from many DJs, surely to give you an idea of which song should make your playlist for the father-daughter dance on your wedding day.You can listen to our inspirational playlist here: http://www.weddingforward.com/father-daughter-wedding-dance-song-ideas/. Enjoy it!